Hey everyone today I was excited to get the mail and received my very 1st Glossybox. Now I had learned about this sample service a while ago but unfortunately it was only available in the UK. 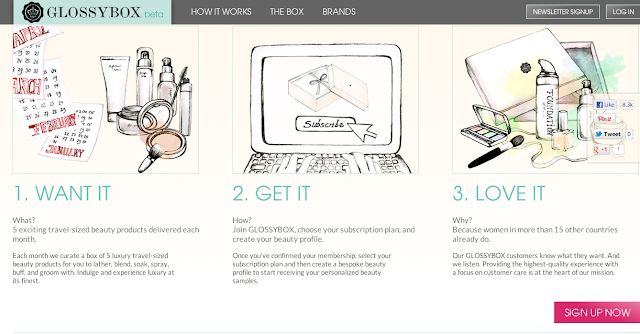 Thankfully they expanded and now US residents can get in on the awesomeness that is this beauty box! I love the pink box of course. Very sturdy and good quality. Definitely reusable! Now what is different and exciting about this is that the items are from different places of the world! This Amore Pacific Hydra Gel is from South Korea and a full size is $100!!!! Thank god I am able to try the sample. A face brush from Glossy Box for travelling. I was definitely pleased with my box and look forward to to others! Also if you leave feedback on the items you earn what is called Glossy Dots that you accumulate towards free boxes! Every women wanna get that. Great box! I love that polish and lipstick, so pretty!